I have loved The Wizard of Oz since I was a young child. I was Dorothy twice for Halloween, and even as an adult I have continued to love it, although I obviously don’t watch it as much…until lately. You see, my little boy, Rowdy, wanted to watch the movie a few weeks back when he saw The Tin Man on the cover (he’s currently obsessed with robots and The Tin Man looks like a robot to him). 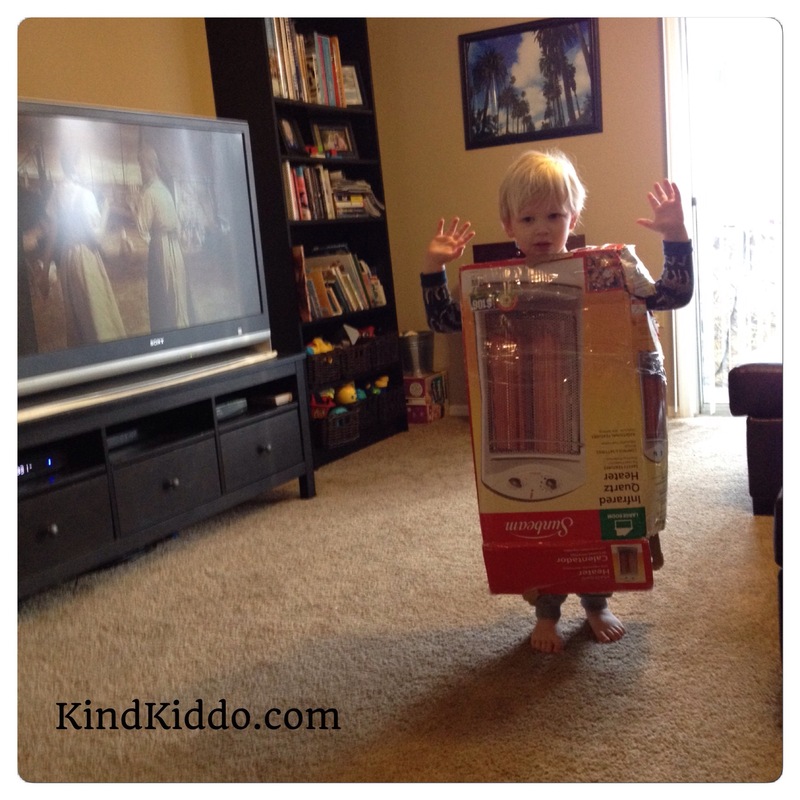 Since then he has watched the movie many times and even watched this morning dressed as The Tin Man (in a box – see pic above). He was so into the character that he had me oil him about 9 times throughout the duration of the movie and wore that damn box the entire time. That’s commitment. As parents we all have or will find ourselves hoping our children will love some of the things we love. It helps us connect with them and establishes a sense of tradition. Yes, sometimes parents take it too far and live vicariously through their kiddos in a not-so-healthy way, but for the most part I think we have good intentions. We try and try to introduce them to things we’re familiar with in hopes they will love it like us, but you just never know when they’ll catch you by surprise and do it on their own. That’s what Rowdy did. And now, if even for just a small moment in time, I have my very own Tin Man. Previous Flying With a Preschooler and a Baby Alone – You can do it! Next How much should I play with my kids?